Oscar Neimeyer is probably the last of the great architects of the mid-20th century still alive today. A contemporary of the likes of Le Corbusier, and Louis Kahn his portfolio of work is mind boggling. And the most amazing thing is that even as he nears 100, he is still designing buildings. Jonathan Glancey interviews him as he turns 100. Read on. Niemeyer has had quite a life. Fifty years ago, he began work on the first of his eye-catching civic monuments for Brasilia. This was the stunningly beautiful Alvorada Palace, the official residence of the Brazilian president and a building like no other in the modern world. Newly restored, this diaphanous structure sits on a peninsula overlooking the yacht-studded, artificial Lake Paranoa. It shimmers from the far side of an immaculate, perfectly geometrical lawn. A discreet moat, veils of hummingbirds and a polite modern gatehouse are all that separates this colonnaded building from the rest of Brasilia, one of the most extraordinary cities on the planet. Brasilia remains an amazing feat of architectural daring, radical urban planning and political will. Its futuristic centre – a World Heritage Site today, along with such places as Machu Picchu and Pompeii – was realised in just 41 months, spurred on by Juscelino Kubitschek, the populist Brazilian president who, when he took office in 1956, promised “50 years of progress in five”. The men he appointed to give shape to his dream didn’t disappoint. “JK’s” city, inaugurated in 1960, was planned by the Brazilian architect Lucio Costa, who offered his protege Niemeyer the architectural gift of a lifetime: the design of all the set-piece buildings of one of the most improbable and distinctive cities in the world. Here, a powerfully emblematic Congress building. There, an arcaded Palace of Justice. Here, sleek ministry headquarters. There, a revolutionary cathedral and glamorous, ultra-modern apartment blocks. Niemeyer smiles. If work on the new Angolan capital were to take 16 years, he would be 115 at the time of its inauguration. The architect turns 100 in December and every day he comes to this penthouse studio, perched atop a curvaceous 10-storey art deco block known, for obvious reasons, as the Mae West building, in the centre of Rio de Janeiro’s Copacabana beach. Here he draws, talks to colleagues, family and friends, eats lunch at a table overlooking white sand beaches and the rolling Atlantic, smokes small cigars, drinks a glass of wine and draws some more. He enjoys the company of writers, philosophers, scientists, journalists – and politicians of a certain stature. Castro has been here several times. Not so long ago, the Cuban president said: “Niemeyer and I are the last communists on this planet.” A member of the Brazilian Communist Party since 1945, Niemeyer was presented with the Lenin Peace Prize in 1963. A few weeks ago, Hugo Chavez, the radical president of Venezuela, came to spend time with Niemeyer. Famous architects drop by on any pretext; none, though, is more famous than Niemeyer himself. He is the last of the “heroes” of the Modern movement. Le Corbusier, Mies van der Rohe, Frank Lloyd Wright and Alvar Aalto were all in awe of this young Brazilian who single-handedly transformed architecture into a wonderful thing of sensuous curves, lightness and unforgettable forms. Even then, they didn’t always understand the ways Niemeyer was transforming Modern movement architecture to suit Brazilian conditions. Today, Niemeyer lives in what he calls “an ordinary apartment” in Copacabana close to his studio. The Canoas House, set among banana and jackfruit trees beside a plunging river with ocean views, is now the headquarters of the Oscar Niemeyer Foundation. “I don’t like to talk about architecture,” he says. “Life is too short for that, a breath, that’s all – it matters far more than buildings.” This seems an odd thing to say for a man who has not only designed some of the most admired, and beautiful, buildings of the past 70 years, but who has lived and breathed architecture as few others have, and who has outlived his contemporaries. “All my old friends and sparring partners are dead,” he says. What I like most about his best buildings is that they seem to have emerged in an instant, as if fully formed from his mind, hand and eye. They are as they are and you cannot imagine them being any other way; they seem to spring naturally from their sites, whether in the blazing civic plazas of Brasilia, or in the mountainous hills above Rio. Niemeyer’s first fully curved building, the church of Sao Francisco de Assis at Pampulha, appears to be formed from a single flowing line. It is a happily inventive, moving building, seemingly designed all at once, without a single doubt in the architect’s mind. “This is how it was,” says Niemeyer. “Architecture for me has always begun with drawing. When I was very little my mother said I used to draw in the air with my fingers. I needed a pencil. Once I could hold one, I have drawn every day since. The buildings do appear on paper the way you say, but they are not the result of gratuitous brushstrokes. The pencil is guided by so many thoughts stored away in my mental library. But, when I have looked at the site for a building, considered its budget and thought of how it might be built, and what it might be, the drawings come very quickly. I pick up my pen. It flows. A building appears. There it is. There is nothing more to say. When I revisit the Museum of Contemporary Art, I talk to visitors who come from all backgrounds, including the poverty-stricken favelas of Rio; they clearly take pleasure from it. Newly married couples come here to have their photograph taken. Children run up with their arms open as if to embrace this striking, yet welcoming building. A work of art, it exists just this side of a drawing from the Jetsons cartoon. Sometimes Niemeyer’s instant buildings can veer towards the glib, or the vacuous, as with the brand new National Museum at Brasilia, a white 80-metre concrete dome wrapped around, inside and out, with a twisting, elevated walkway. It’s a fine conceit, but with nothing to show inside – no collection, only one gallery – the building is an exhibition of itself. Truly, a building needs a function, and while Niemeyer is a prolific form-giver, even he needs to be challenged and if not reined in, then disciplined by the demands of a purposeful brief. Which is why the great curves of the principal buildings of the Constantine University at Ain el Bey, Algeria, commissioned by president Houari Boumedienne, or the breathtaking dome of the Communist party headquarters in Paris are so convincing; these are glamorous, signature buildings working hard for their living while delighting everyone drawn into their orbits. Niemeyer emerged, from obscurity and a lazy education, as one of the most original and talented of all Modern movement architects, with a highly informed and almost intuitive understanding of the possibilities of reinforced concrete construction. In his native Brazil, steel was far too rare and expensive for use in the majority of buildings, while concrete was not only cheap, but it could be stretched to unimagined limits while being poured and moulded by relatively unskilled labour. In concrete construction, Niemeyer could see a way of shaping an architecture that would not only be modern, but would also echo the Brazilian landscape he loved, and which he drew, increasingly, in the guise of curved female forms. His chance to shine came in 1936 when Gustavo Capanema, the idealistic Brazilian minister for education, commissioned Lucio Costa to design the country’s first Modern building, a headquarters for the health and education ministries in central Rio. Costa and Capanema decided to seek the advice of Le Corbusier, the greatest of all Modern architects. The famous Swiss-French visionary and architect flew to Rio. “In the Graf Zeppelin,” says Niemeyer, referring to the magnificent 237-metre German airship that, between 1928 and 1937, made 143 impeccable transatlantic flights. “I went to meet him,” he adds. Working for nothing, and reliant on his family – his father was a graphic artist, his grandfather a Supreme Court judge – Niemeyer transformed the Corbusier scheme into the serene high-rise building that adorns central Rio today. A National Monument, it has since been renamed Capanema Palace. Le Corbusier had been deeply impressed by Niemeyer’s burgeoning talent. 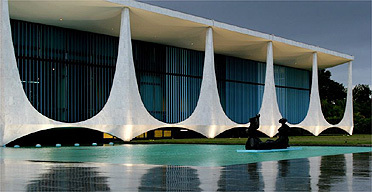 Although rigid by Niemeyer’s later standards, the palace abounds with curves inside; its exteriors are decorated with romantic wall tiles, depicting scallops and sea horses, and shaded by deep sun-louvres. Immensely photogenic and a superb fusion of art, engineering, landscaping and architecture, this confident new building was ecstatically received in 1943. By then, Niemeyer, who had silently encouraged Le Corbusier to introduce curves into his designs, had developed his unmistakable free-flowing style with a wave of new buildings at Pampulha. At Brasilia, 15 years on, he balanced curves – those of the new cathedral and of the domes of the Congress building – with right angles, those of the city centre’s 20 identical ministry buildings lining the city’s Monumental Axis, and innumerable glamorous apartment blocks. In 1961, the military seized power in Brazil. Niemeyer chose exile for many years, mostly in Paris. Here, aside from forming close friendships with Jean-Paul Sartre and AndrÃ© Malraux, author, adventurer, RÃ©sistance hero and France’s first minister of culture, Niemeyer designed beautiful buildings in western Europe and north Africa. Because he was an architect, above all else – and architects like to build – Niemeyer continued to design projects for Brazilian clients. Most surprising of all is the gigantic and rather terrifying General Army Headquarters (1971), in Brasilia, a structure that would not have looked out of place in Saddam’s Iraq. This, unsurprisingly, is not something Niemeyer likes to discuss. He simply changes the subject. Except, of course, Niemeyer himself. I still find it hard to think that the man I leave at his drawing board in Rio is the same young architect who went to meet Le Corbusier stepping down from an airship here more than 70 years ago. But when he draws – those simple, perfect, seductive drawings – the old man and the young man are clearly one and the same. It must be hard being a living legend, which is why, despite having created some of the most compelling buildings and monuments of the past 70 years, Niemeyer likes to say that he doesn’t like to talk about architecture. Perhaps he doesn’t need to. Just look at what he has built.